I was out on a service call for a washer the other day and noticed that the fill hoses were in pretty bad condition. 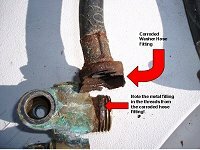 I pointed this out to the customer and recommended that she install steel braided fill hoses with stainless steel fittings to avoid these problems in the future. Admittedly, this is an extreme case, but here’s the kicker: your washer hoses can be in much better condition than the hose shown above and they can still burst! How ’bout we avoid this unhappy event by installing steel braided fill hoses? Want more pearls of wisdom on preventing washer floods? Ok, read this. This entry was posted in Washer Repair on August 28, 2003 by Samurai Appliance Repair Man.